Jet Airways has in the last two months trimmed its fleet by 28 planes and will ground about a dozen more aircraft in March mainly due to non-payment of rentals and lack of spare parts. 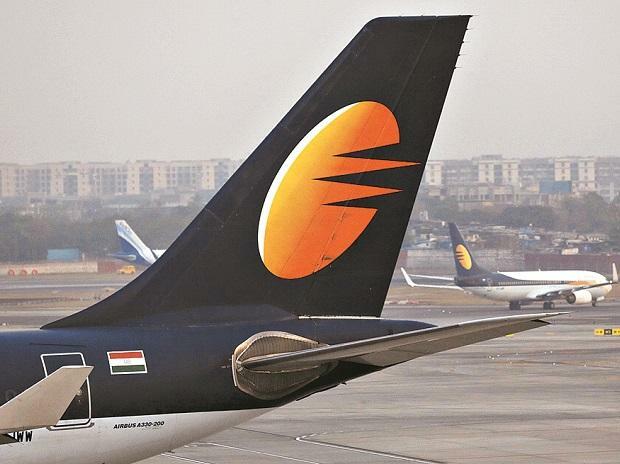 Crisis-hit Jet Airways Ltd said on Wednesday it grounded seven more aircraft as the carrier failed to make payments to its lessors, taking the tally of planes hamstrung by the defaults to 13 this month. With debts of more than $1 billion, Jet has defaulted on loans and has not paid pilots, leasing firms and suppliers for months.The loss-making Indian airline approved a rescue deal in mid-February after months of talks to plug an 85 billion rupee ($1.2 billion) funding hole.The plan, which has also been approved by Jet shareholders, includes selling a majority stake to a consortium led by State Bank of India, the airline's biggest creditor, at 1 rupee. A media report said Jet Airways has in the last two months trimmed its fleet by 28 planes and will ground about a dozen more aircraft in March mainly due to non-payment of rentals and lack of spare parts. This makes it almost one-third of Jet Airways' fleet of 123 planes. Jet is "actively engaged" with all its aircraft lessors, the airline said, adding that its aircraft lessors have been supportive of the company's efforts to improve liquidity. Cross-checks of the Jet Airways fleet by Reuters on FlightRadar24 also show that nine of its planes have stopped flying over the last four weeks. The airline further added that another 77 flights were cancelled due to the closure of a Mumbai Airport runway until March 30 for maintenance and repair work. You can view the entire list of cancelled flights here. International lessors had grounded more Jet Airways planes before potentially moving them out of India, as scepticism built over whether the bailout of the carrier can clear their dues on time. On Saturday, the airline revealed it had grounded two more aircraft in addition to the four earlier this month over default to its lessors. Jet has a fleet of about 123 mainly Boeing planes, including 16-owned aircraft. The rest are leased from a range of lessors including GE Capital Aviation Services, U.S.-based BBAM and Japan's SMBC Aviation Capital, sources have said. Jet Airways on Wednesday also said it continues to provide required and periodic updates to the Directorate General of Civil Aviation (DGCA). Meanwhile, Jet pilots have called off their proposed strike from next month in view of the developments on the nation's Western borders. The Naresh Goyal-founded airline has 1,600 pilots, over 1,100 of whom are unionised and represented by the NAG. Pilots had on Monday said that they would not perform additional duties and wear black bands from March to protest against salary delays. The airline has been delaying salaries to its pilots along with engineers and senior management since last August. "As you are aware, we were planning a flight safety period from March 1. Everything, however, needs to be done at an appropriate time. The country is in a state of high alert following the events across the border. At a time like this, we need to stand united with the rest of the country," NAG said in a communication to its members. "All are informed that the flight safety period and the black band protest has been called off till further notice," the guild added and expressed hope that all its members will see the reason in deferring the protest call and stand united behind the decision. Jet on Tuesday paid the balance 25 percent of the November salary and 12.50 percent of the December salary. In a communique sent to pilots, NAG had on Monday said 25 percent of November salary along with 12.5 percent of December salary would be processed in February. Jet Airways has a debt of nearly Rs 8,200 crore and needs to make repayments of up to Rs 1,700 crore by March-end.